Our Second meet up of the month was a meal in our regular haunt of the Coulsdon Manor Hotel. A speaker then discuss some business matters over a drink. After a talk from guest speaker Richard Dean. It was down to business. But first a pee break and another round of drinks from the bar. We welcomed a new guest, a prospective member and Tabler Tony received much mocking for forgetting to invite Phil back, who everyone liked during his first visit to the Fish&Chip night. We received news that our esteemed and long-time veteran member of Round Table, Mr Any Parr MBE, was running as an independent Candidate for East Surrey . We wished him well and Andy as always, promptly persuaded us to help deliver leaflets in places of East Surrey where they may have not hear of him. Yes, it’s true. As all of Caterham know him as Mr Caterham Festival, but elsewhere maybe not. We highlighted the success of gaining a presence on MeetUp – a great website and app where we can list our public events and local people can RSVP their attendance. So look out for that. Paul – Sold some more Raffle tickets to win a Caterham7 car, raising funds for Sunnydown school in Caterham. There are only 199 tickets, so the odds are better than the lottery and you need to be quick to secure your ticket now – See Sunnydown’s website to secure your ticket before the 3rd June raffle draw. For those interested in dressing to impress. You’ve earned it! 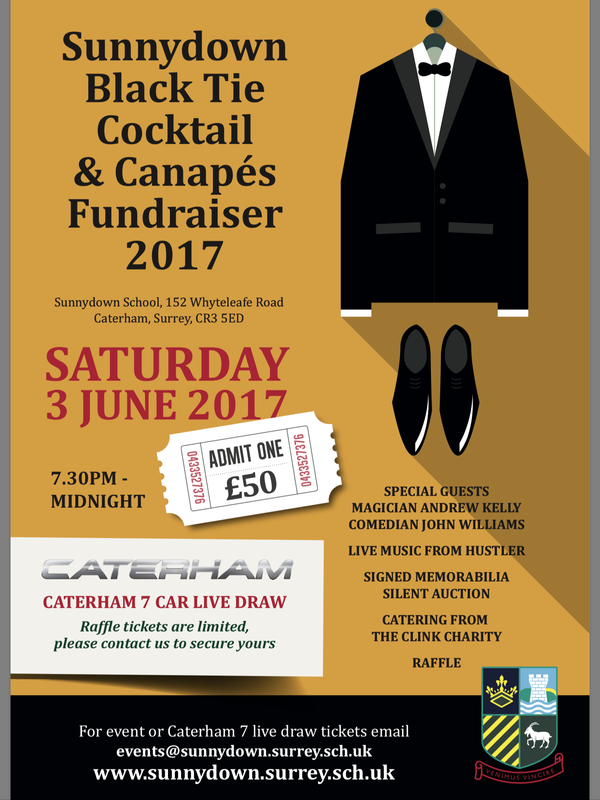 You are all invited to Sunnydown Shchool’s Black Tie Cocktail & Canapés Fundraiser 2017 held in the historic building of the school and witness the much talked about, Caterham7 draw. It’s great value at only £50 per ticket for something that rarely happens in Caterham. Our Second meet up of the month was a meal in our regular haunt of the Coulsdon Manor Hotel. Our guest speaker Richard Dean, who you may recognise as a regular face of or the Beer-o-de-change at the Caterham Beer Festivals, but professionally he is the face of Caterham Accountants Tax4Today. [He’s a trusted pair of hands for anyones financial affairs]. Richard spoke of his involvement the Purley branch of HCPT giving local kids with any variety of special needs or difficult family situations, a holiday to Lourdes, whilst also giving the kids families some respite. The take-away message for the 25 Tablers there, was that the experience of being away from their routine home environment in a group really does change the lives of these young people. Richard also spoke of the rewarding experience the volunteer carers have by being involved and why they volunteer year on year. The charity needs £750 for each place, usually asking only for a very small donation form the parents (who may be in crisis anyway), the rest being raised through various fundraising efforts. Richard spoke of the experience the volunteer Carers, who take the kids and cover their own costs. In a heartbeat the Round Table voted to release £750 form their Charitable Trust, to cover one place for a local child for 2018. We also decided that if a volunteer carer is unable to fund themselves that they come speak to the Caterham Round Table to see if we can help further. Another good night of beer food with the lads and being part of a decision to help out a local family and change their lives for the better. Get ready for the May-the-Forth-be-with-you social media frenzy. Back in the real-world social network of Caterham Round Table… We started May with a social pub night, frequenting the Harrow Pub in Caterham for their £5 fish-n-chips meal deal. We welcomed a handful of guests, who came to see what we are about and to meet the guys. Whilst not a meeting as such, the smaller teams began discussing over a drink, the details for the upcoming their upcoming events. There’s the Monopoly Pub Crawl, Dad’s-and-kids’ camp, Waller Pain Cycle Hillclimb, the Mummers Play pub tour and not forgetting the big stuff on the far horizon of the Caterham Beer Festival and Caterham Fireworks. The publican of the Harrow was kind enough to allow Paul to sell tickets to the customers for the raffle of a Caterham Car in aid of Sunnydown School (199 tickets at £100 each). Better odds than the lottery! Details on how to get your raffle ticket. Be quick as quick as a Caterham car, as there are not many.